The day after my first encounter with Milky Way photography I decided to return to the exact same location for some sunset photography, back into my comfort zone. Although, living in the flattest country in the world, photographing around sunset or sunrise in a mountainous environment like Zion NP isn’t actually that much of a comfort zone. I had already made up my mind for my favourite composition here so I positioned my tripod, got the right filters, created the composition and while the colours were quickly intensifying I started exposing. 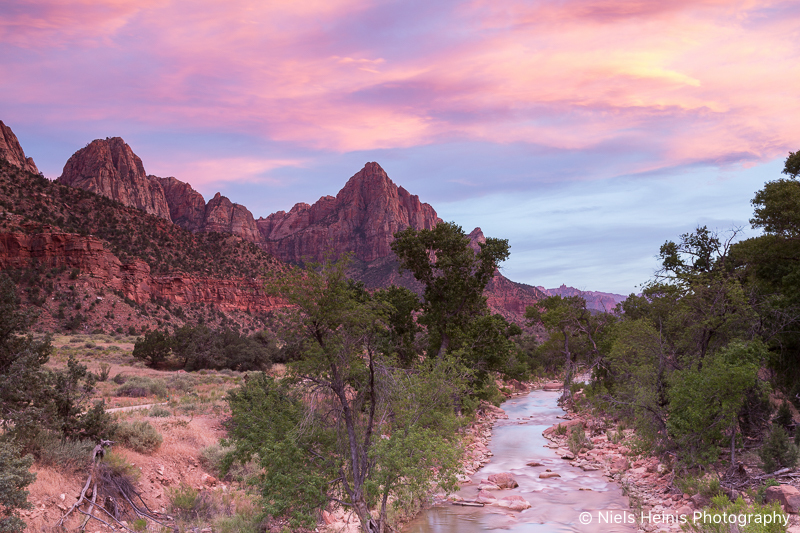 And then all of a sudden it happened: the sky was full of beautiful colours that perfectly blended with the intense colours of the Zion NP rocks. I kept exposing and went for a few different compositions. It just lasted a few minutes and then the moment was gone. Luckily I adhered to one of the first lessons in landscape photography I learned: never leave early. It got me that amazing feeling: Got it! Early June I was in the US for a conference and was able to stay in the region a few more days. 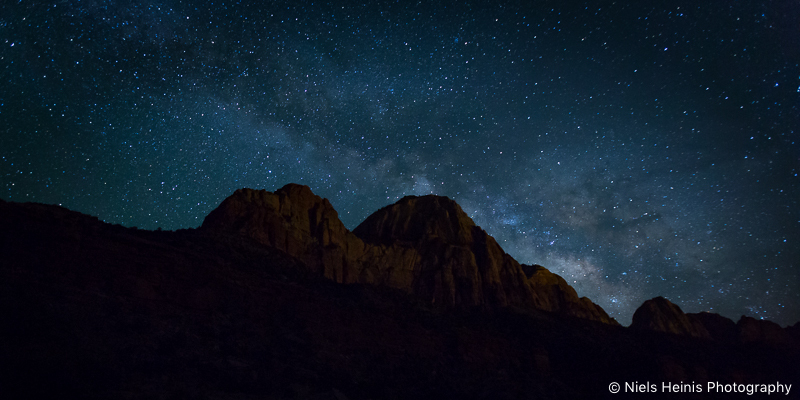 I went to Zion National Park where I had my first encounter with Milky Way photography. 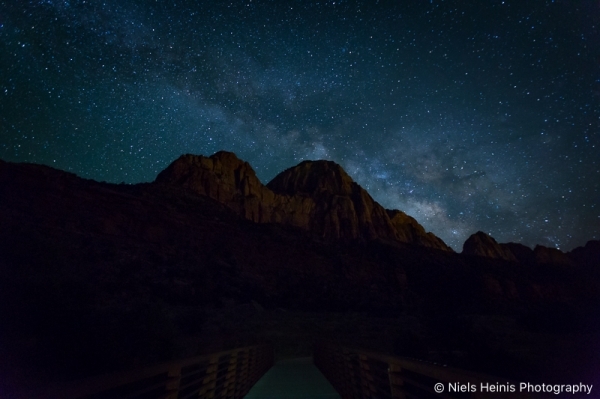 It’s amazing how bright the Milky Way appears in dark areas like Zion. These photos were taken close to the Virgin river. The mountains are subtly lit by the lights from the town of Springdale. I learned a lot this night and would really like to give it another go one day once I find some dark enough location again. Begin juni was ik in de VS voor een conferentie. Na afloop ben ik nog enkele dagen naar Zion National Park gegaan om te fotograferen. Daar had ik mijn eerste kennismaking met het fotograferen van de melkweg. Prachtig om de melkweg zo helder te kunnen zien op een donkere locatie zoals Zion. 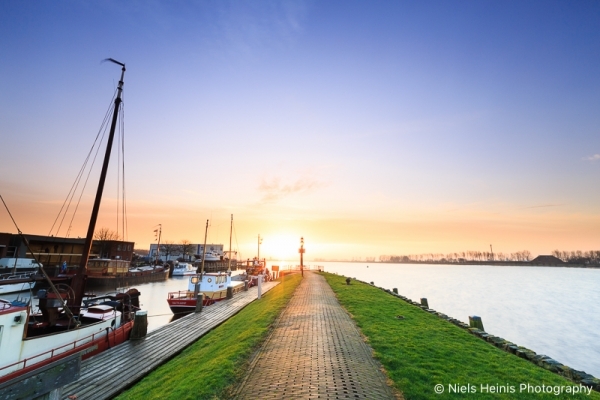 Deze foto’s zijn dichtbij de Virgin rivier gemaakt. De bergtoppen worden subtiel verlicht door het nabijgelegen dorpje Springdale. Ik heb een hoop geleerd in deze nacht en ga het zeker vaker proberen. Nu op zoek naar voldoende donkere locaties. 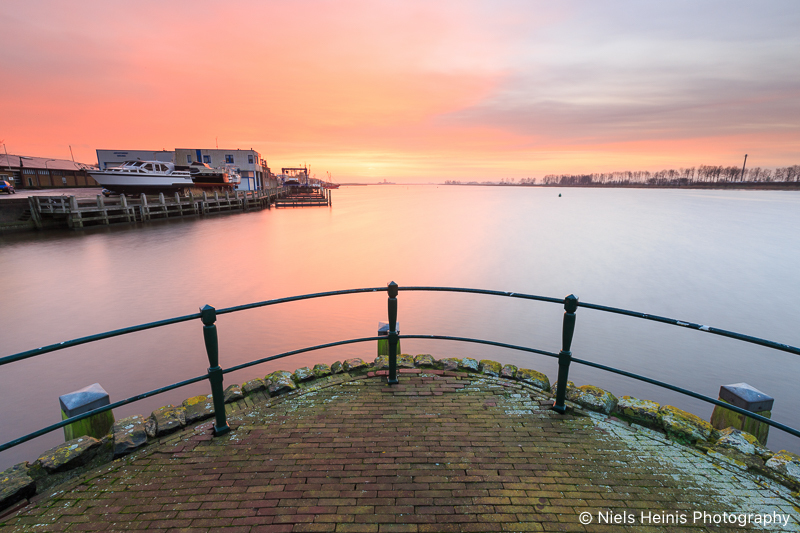 Vrijdag besloot ik, op basis van de weersverwachtingen, om de volgende ochtend mijn eerste landschapsfotografie activiteit van 2016 te ondernemen. De locatie werd Zoutkamp. Toen ik zaterdagochtend wakker werd zagen de voorspellingen er helemaal niet meer zo goed uit, maar toch maar op pad. Eenmaal buiten had ik ook mijn twijfels. Na verloop van tijd worden de eerste kleine beetjes licht zichtbaar en blijkt er in elk geval de nodige tekening in de lucht te zitten. Het schouwspel dat zich uiteindelijk voor mijn ogen voltrok overtrof mijn verwachtingen ruimschoots. Deze foto’s zijn voor mij het bewijs waarom je ook bij twijfel over de omstandigheden, toch gewoon op pad moet gaan! Na een kop koffie bij de plaatselijke bakker na afloop was er niets meer wat wees op een mooie ochtend, de wereld was weer grijs…. 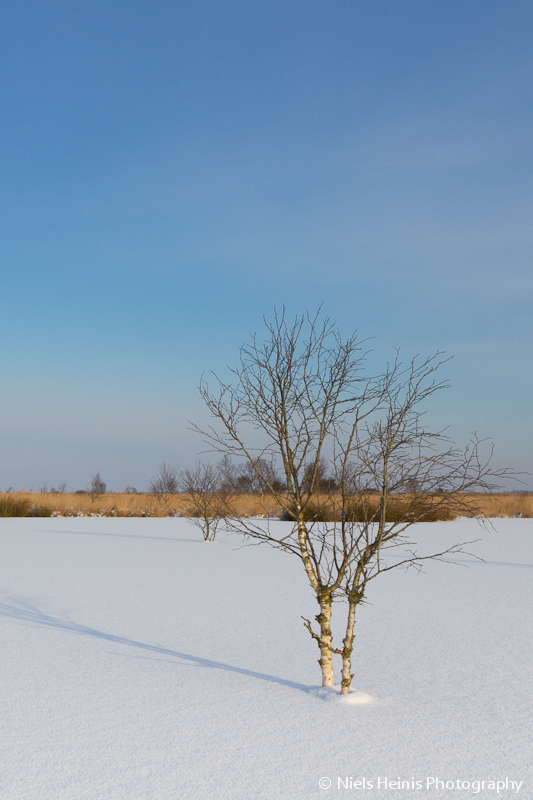 Yesterday I went for an early morning landscape photography session in Drentsche Aa national park. The day before I visited the area and found some potentially nice locations. The weather forecast looked quite ok; retreating clouds followed by sunshine. 6:00 o’clock sharp I left home and drove towards Oudemolen. 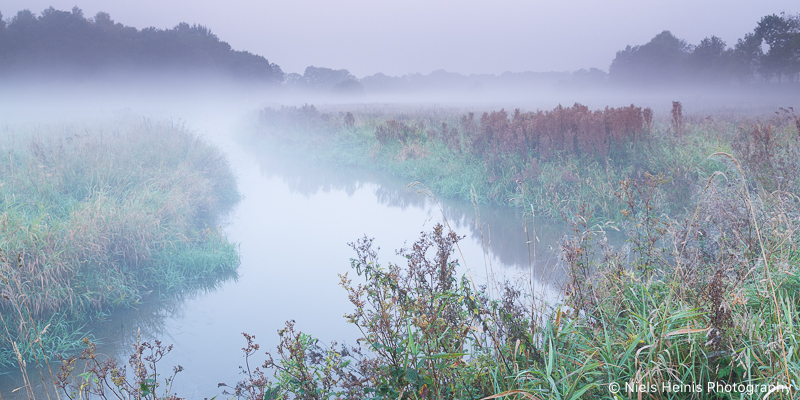 The closer I came, the more it became clear I would be facing quite a bit of mist. Nice! And mist it was. A lot of mist actually and no clouds at all. So much for the weather forecast… I brought two additional tools this morning: my bike and a proper flashlight. And I was happy to have both. The Drentsche Aa region is quite extensive so a bike really helps you out there. And in the dark, in the mist, on a bike a flashlight is a must! When I arrived at the previously spotted location I turned the flashlight off and gave my eyes a bit of time to get used to the darkness. It was still another hour until sunrise so I took the time to explore various compositions and drink a cup of coffee. I love it being out there on such moments, simply enjoying nature in utter silence. While sunrise came closer I exposed a couple of times but also notices some clouds rolling in from the east. Unfortunately they blocked the sun and eventually it turned out they would keep doing so until around 10 o’clock. It was a nice morning with few ‘ok’ exposures. For the way back I decided to pick a route along which I would see some more of the region, spotting locations for future photography sessions. For some odd reason, when I was already getting closer to the carpark, I took a wrong path but before I realised I was treated with a special surprise. I quickly parked my bike and got my camera out of the bag. 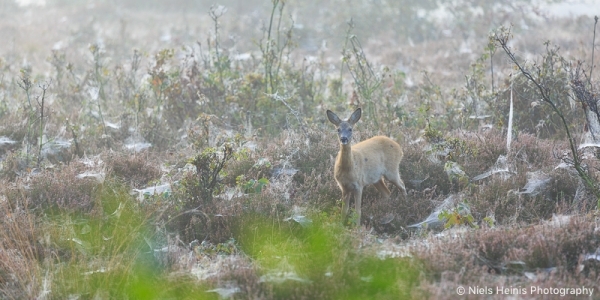 The deer and I kept on looking at each other for a few minutes and it allowed me to shoot it (the only right way!) from different angles. With a happy feeling I figured out the fastest way back to the car and decided to get back to the Drentsche Aa soon.